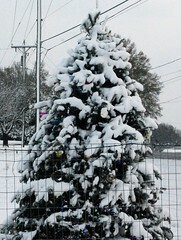 This Christmas was the first White Christmas that Charlotte has experienced since 1947! It didn’t start snowing where we were until dinner, but hey- that still counts! The day after Christmas, Boxing Day for our Canadian friends, CSP, Zoe, and I went out to look at the snow. We got about 3.5-4 inches in our little suburb but in our old neck of the woods they got over 5 inches! That might not seem like a lot to some of you but that’s a big deal in Charlotte and an even bigger deal that it was on Christmas! Plus it was floofy snow. 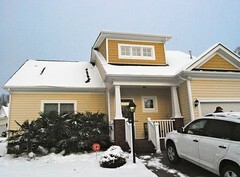 We usually get an ice/snow mix so it was great to have the fluffy stuff. 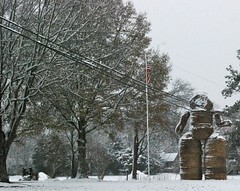 Here’s our snowy house : There’s a farm down the street from us where they turned their hay bales into a big angel! At night his halo and wings light up. So fun! 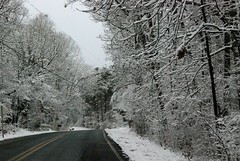 Snow makes even the normally boring drive to Starbucks pretty: CLick on all the pics to enlarge. 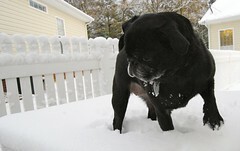 When we returned home we took the pugs out to the back patio to see how they’d like the snow. 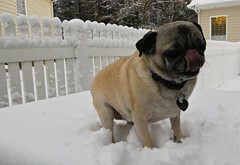 Apparently pugs are not snow dogs! At least ours aren’t! Zoe was determined to keep at least one paw out of the white stuff: Kiki was kind of bored with the whole thing: And Molly was the most pitiful of all! 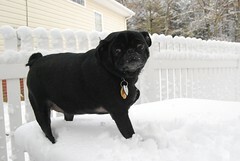 The snow started melting that day and was completely gone within a few days but it was sure fun while it lasted! 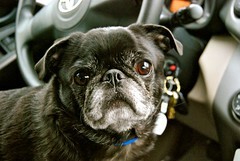 If you’d like to see more pictures click here.